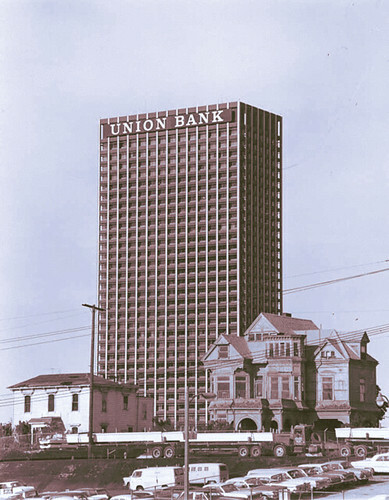 As has been noted, when it comes to Bunker Hill, there is no image as iconic as Union Bank Square—the Redevelopment Project’s first great endeavor—towering over remnants of antiquated Los Angeles. (One could argue there are few sights as telling when it comes to defining Los Angeles in general.) But while we’re all familiar with those 42 stories of mid-60s glory, who remembers what stood there before? It was that hitherto unsung monument of Los Angeles deco: the Monarch Hotel. From the outset, crime dogged the Monarch. Sort of. 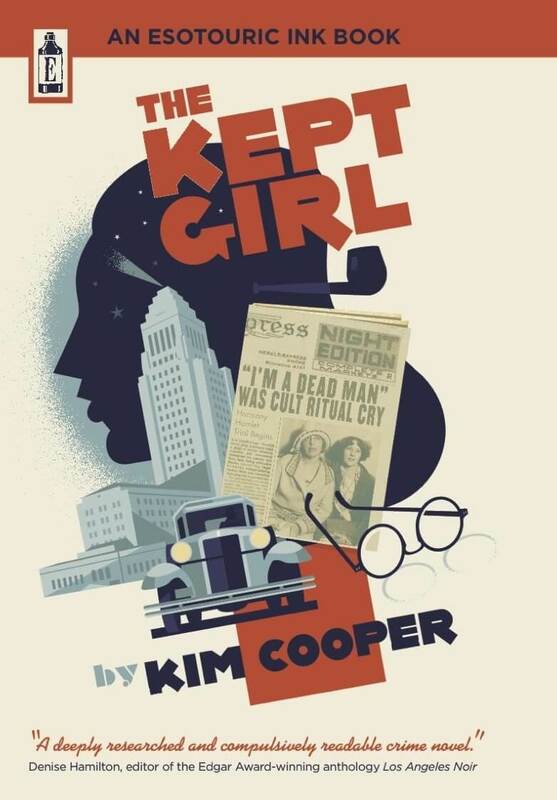 The first occupants of the bridal suite, in November 1929, were Motorcycle Officer Bricker of Georgia-Street Traffic Investigation and former Miss Losa Pope (the now newly-minted Mrs. Bricker, a purchasing agent at Forest Lawn). They met when he had arrested her for speeding. On their first morning together as Man and Wife, breakfasting on the roof garden outside their bridal suite, they were mobbed by twenty some-odd members of the Force who decided to burst in and make merry with fellow officer and his tamed scofflaw. Night clerk H. N. Willey was behind the desk at the Monarch when, just after midnight on June 16, 1930, a bandit robbed him of $26. Willey phoned Central Station. Meanwhile, officers Doyle and Williams, on patrol, observed a man hightailing it through an auto park near the hotel. Deciding that he wasn’t running for his health (this being some years before the jogging craze), they gave chase and caught him in an alley. They next observed a patrol car flying to the Monarch. Putting two and two together, they took their prisoner to the hotel, where he was id’d by Willey. Turns out he was George H. Hall, 24, a recent arrival in Los Angeles. H. N. Willey continued to ply the night clerk trade, and was doing so when two men entered on the early morning of August 31, 1931. When Willey showed them to their room, they pulled out a gun and tried to lock him in the closet. The attempt failed because the door had no outside lock, so the hapless crooks ran downstairs, recovered the $2 they had paid for the room and fled. H. N. makes the papers again in November of 1931, when on the Wednesday before Thanksgiving Los Angeles is hit by a massive crime wave, in which over a dozen brazen robberies of hotels, groceries, theaters, pedestrians, folks in autos, etc. are shot at and robbed; Willey looks down the barrel of a large-bore automatic and forks over $25. One thing that’s nice about the Monarch? It’s nice to have a bar downstairs. 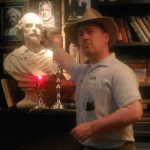 Edgar Lee Smith lived, and drank, at the Monarch. August 23, 1946. Smith, 51, had been drinking in the Monarch bar but neglected to keep to the cardinal rule of always keeping on the good side of one’s bartender. This resulted in an after-hours duel that left his bartender, James Donald Chaffee, 28, stabbed to death. When the Radio Officers Hill and Finn found Chaffee’s body on sidewalk, they went to Smith’s room, where they found him changing his clothes, and seized a penknife with a one-inch blade. The fight began when, according to Smith, “Jimmy got sore because I stole his girl.” Smith added that barkeep Chaffee, in retaliation, cut Smith off. Smith, in counter-retaliation, cut Chaffee. Smith plead guilty to manslaughter and was sentenced to one to ten in San Quentin. Gilbert Carvajal was a 17 year-old Marine stationed at Del Mar, part of Pendleton. He was at the Monarch on May 9, 1957, with his 45 year-old lady-friend Frances Nishperly when it all began. It was 1:15am and he decided it wise to hold up night clerk Frost E. Stacklager (H. N. Willey having retired, apparently) and make off with $22 and jewelry. A few minutes later the two robbed the Trent Hotel of $57.50; despite holding the clerk at knifepoint, the two next fled the Floyd Hotel empty-handed, but snagged $45 from the till at the Auto Club Hotel minutes later. At 23rd and Scarff Sts. the police began shooting into Carvajal’s car—he tried to make a run for it but was shot down in the street, taking one to the chest. Ms. Nishperly insisted Carvajal had kidnapped her from the corner of Pico Blvd. and Hope St., but police elected to discount this story. Now, people are forever plunging off the precipices afforded by tall structures (a quick peruse of On Bunker Hill proves that) and that’s a person’s right and due. But it’s different when it’s an excited doggy. Buddy’s daddy, Jimmy Van Scoyoe, was looking frantically for his pooch and had no idea of his aerial adventure when he peered off the roof and saw his Buddy surrounded by a puzzled crowd. Jimmy is reported to have tightly clasped Buddy in his arms and vowed to never let him out of his sight again “even if I have to keep him in bed with me when I go to sleep.” Damn straight! SE corner of Franklin and Gramercy… …of course, what they’re best known for is La Belle Tour. Consulting architects on the Monarch were Hillier & Sheet, probably best known for Beverly Blvd. landmark the Dover. While Mediterranean in manner, their 1929 complex on the NE corner of McCadden and West Leland Way is mysteriously named the Aloha. But this one on El Cerrito was demolished; an 80s building of unusual blandeur has taken its place. Hillier & Sheet announce this height-limit Norman job will go up at Fountain and Sweetzer; it does not materialize. S. Charles Lee’s El Mirador, though, does. Who loves the lost Monarch? People are quick to fetishize the felled Richfield Tower, and with good reason (I, too, am an ardent obsessive—even owning parts of it); but isn’t it a bit…New York? Doesn’t it owe a major debt to Hood’s American Radiator Building? Sure, some might argue that the Streamline Moderne is more natively Angeleno, but not only was that industrial-inspired application an Internationalist movement, but one also feels in its nautical element a particular evocation of our neighbor to the north, San Francisco. What is elementally endemic to the land, here, is the Ziggurat Moderne of the Monarch Hotel—that there is something in the setback style that elicits a feeling for the indigenous, the “really” American, in that the mock-Mayan comes closest to the true architecture of this part of the world. The core of this argument comes, of course, from Francisco Mujica’s 1929 History of the Skyscraper, where he hints at just that—that pre-Columbian pyramids are the correct expression of modernity, and vice versa (hence the natural evolution of the 1916 New York setback laws…glorious mother of what Koolhaas termed the Ferrissian Void). …we should take that as monumentality in its most impressive (if not oppressive, if that’s what reverberates in your Incan blood) form. After fifteen years of Sturm n Drang, on February 3, 1964, the $350 million Bunker Hill Urban Renewal Project got its first bite—Connecticut General Life offered $3.3 million for the block-square site that housed the Monarch Hotel. Some of the luster of Sesnon’s kickoff was dulled when in 1966—with the Union Bank half built—City Administrative Officer C. Erwin Piper and his staff issued a scathing report on the CRA. It sited faulty operational control, an absence of clear-cut policies and poor internal coordination, at terrific taxpayer expense. By the end of 1967 no more land had been disposed of, the CRA had lost half its department heads, had no executive director, and Sesnon had been replaced by Z. Wayne Griffin. The Battle of Bunker Hill would continue to be waged—that long, slow, protracted engagement, which like its previous fifteen years, would need another fifteen years before things shifted into high gear again. Looking north across the intersection of Sixth and Fig, 1957. The Jonathan Club on the left, behind that, the Carlton. The marquis at right, the Gates Hotel. …the black ’54 Packard coming at us is pretty cool too.